Monday’s 2-0 win over Nottingham Forest, during which 24-year-old Enrique (pictured right) scored his first goal in club football, means it is now a question of when rather than if United confirm their return to the world’s most glamorous football league. It could be as early as Saturday if Newcastle win at Peterborough United and Forest continue their losing streak away from home at Bristol City. Thoughts will then turn to the work needed in the transfer market to stop the club’s next top-flight campaign going the way of its last and ending in relegation. Enrique wants to see United strengthen, but the Spaniard was careful to take the pressure off owner Mike Ashley by declaring that he will not lose any sleep if they do not. “We have a good team for the Championship – a very good team for this division,” said the man signed by Sam Allardyce from Villarreal in 2007. “We need players for next season in the Premier League, of course, but that is normal – every team will need new players. “It is not my work to say how many but I hope we will sign some new players because it is good to have a big squad. Newcastle’s squad is packed with Premier League experience, something which has been apparent as they have outclassed Championship opposition all season. Fabrice Pancrate has never played in England’s top-flight, although he is unlikely to get the chance to rectify that next season. an option to extend it, it is one they are unlikely to take up. Mike Williamson is the only other senior squad member not to have played in the division, despite having been on the books of Portsmouth and Southampton in the top flight. “Do I think the players who left the club regret it? I don’t know,” said Enrique. “What I can say is every player who stayed at Newcastle following relegation did so because they wanted to. They decided it was better to try and help the team win promotion than leave straight after relegation. That was the same for me. “I wanted to play in the Championship because I knew we had a great chance of getting straight back to the Premier League. Looking back now, I know it was the right decision. He admits, though, it has been tough watching Premier League football on television. “For me, the worst games this season were the first ones,” he said. “I remember saying to Jonás (Gutiérrez) at the end of games ‘I still don’t believe we are in the Championship, it has not sunk in.’ It felt as if we were missing out on something because the Premier League is so massive. Chris Hughton has been shortlisted for the Championship manager of the month award, with Peter Løvenkrands in the running for the players’ prize. 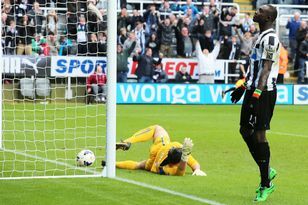 The Dane was outscored 5-4 by team-mate Andy Carroll in March but is perhaps the more diplomatic choice.